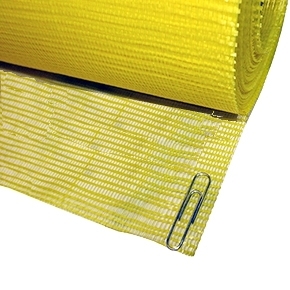 4 inch x 150 Foot Roll, Yellow Resin Coated Fiberglass Reinforcement Fabric with 20x10 Mesh, 1.6 Oz/Yard. Meets ASTM D 1668 Type III. Price/Roll. Sizes: 3, 4, 6, 9, 12, 18, 24, 36 and 48 inch widths.